Alison Roman’s Dining In: Highly Cookable Recipes is the perfect antidote to your extended winter blues (despite the supposed arrival of Spring). Reading her cookbook is just as enjoyable as cozying up by a fire with an enthralling fiction novel, or engaging in an intimate conversation with a dear, dear friend. Roman’s direct and animatedly humorous prose is so refreshingly familiar that it’s hard to turn the pages without feeling like she is there in person, championing the luxuries of a well-cooked homemade meal with a shrug, giggle, and excellently made stiff drink in hand (or so I imagine). The prevailing theme of Dining In is that cooking should be fun, not taxing, and not take up too much time or have too many ingredients. In Roman’s kitchen, imperfections are welcome and eccentricities essential. Just look at some of her recipe titles—"Decidedly Not-Sweet Granola"; "Baked Pasta with Artichokes, Greens, and Too Much Cheese"—for reassurance that your comfort in the kitchen is Roman’s chief consideration. 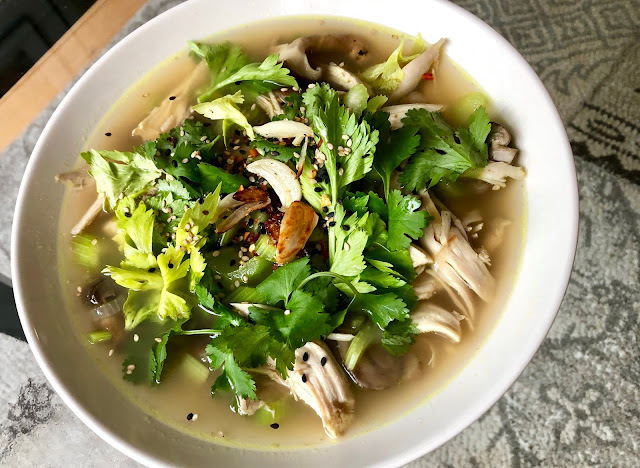 Her declaration couldn’t ring truer for the first recipe I made, Golden Chicken Broth with Turmeric and Garlic for Chicken Soup with Toasted Garlic, Mushrooms, and Celery. A unique twist of ingredients (celery galore, star anise, turmeric, coconut oil) piqued my interest, and an emphatic list of easy substitutions (homemade broth was not mandatory; any hot sauce could substitute for her homemade chili oil) convinced me that the soup wouldn’t be too tall of an order for the two hour slot I had available for it on a Saturday morning. (If you are using store-bought broth, that is. 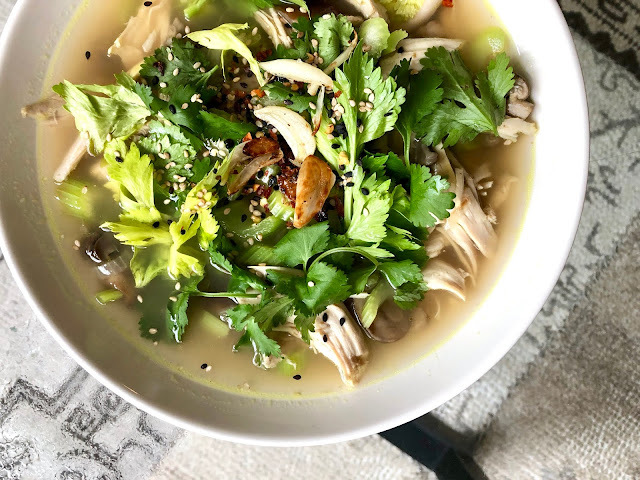 If making broth from scratch, I recommend getting this out of the way the night before—it breaks up the time commitment and refrigerating overnight allows you to skim off extra fat the next day). The soup was incredible, a true winter woe healing experience. Drinking the broth seemed to melt off any traces of lingering seasonal affective disorder and was as warming and rejuvenating as a bright sunny day (“bottled sunshine”, Roman calls it). 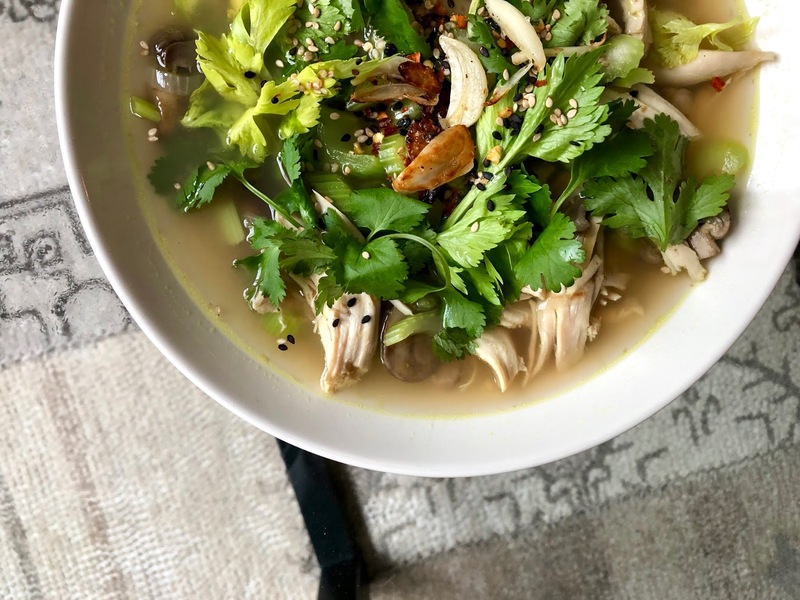 Ginger, turmeric and star anise added impossible richness to the liquid, and the earthy, meaty mushrooms contrasted beautifully to the sprightly, crunchy celery slices. 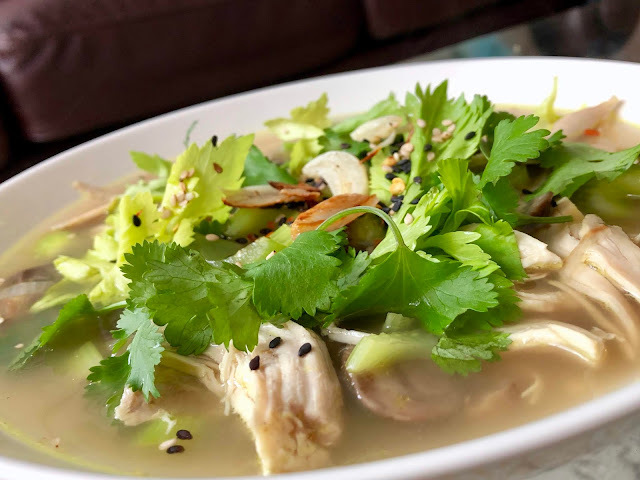 A stir of fish sauce and lime added plenty of salt and acidity to the golden tonic, along with a nod to Thai cuisine, emboldened by the cilantro leaves and chili oil that finished off the dish. The crispy garlic slices are the cherry on top, sautéed luxuriously in coconut oil and bringing a final pop of delectable flavor to the finger-licking (bowl-slurping?) dish. 1. Heat the oil in a large, heavy-bottomed pot over medium-high heat. Add the onion, garlic, fresh turmeric (if using ground, you’ll do it later), and ginger, all cut-side down. Cook, without stirring, until everything starts to lightly char and smells good, about 4 minutes. Add the celery, fennel, bay leaves (if using), and star anise, and stir to coat (add the ground turmeric now also). Cook, stirring everything around, until the vegetables start to soften and take on a touch of color, about 4 minutes. Add the chicken and 12 cups water. Bring to a simmer and reduce the heat to medium-low. 2. Simmer the stock, uncovered, until the chicken is just cooked through but still has some life left in it (you don’t want to dry it out), about 30 minutes. Remove the chicken and let it cool enough to handle (if using chicken parts, skip this step and keep simmering), keeping the stock at a simmer while the chicken cools. 3. Pick the meat from the cooled bird, separating it from the fat, bones, and cartilage, and set the meat aside. Place all the fat, bone, and cartilage into the pot and keep simmering for another 2 to 2.5 hours, seasoning as you go with salt and pepper. 4. Once the stock has been reduced by about a third and is as delicious as can be, strain everything. From here, you can drink it, freeze it for later, or start building a soup. 1. Heat the oil in a large pot over medium heat. Add the garlic, and season with salt and pepper. Cook, stirring occasionally, until the garlic is lightly fried and turning golden brown, 2 to 3 minutes. Using a slotted spoon, remove the garlic and drain on a plate lined with a paper towel. Season with salt and set aside. 2. Add the shallots to the same pot and season with salt and pepper. Cook, stirring occasionally, until the shallots are lightly fried and turning golden brown but are not yet crisp, 3 to 4 minutes. 3. Add the mushrooms, seasoning them with salt and pepper. Cook, stirring occasionally, until they’re beginning to brown and are totally softened, about 4 minutes. Add the broth and season with salt and pepper. Bring to a simmer and cook, uncovered, for 30 to 40 minutes, until the flavors get to know each other and the broth tastes a little shalloty and a little mushroomy, seasoning with additional salt and pepper as needed. 4. Once the broth is as good as can be, add the sliced celery and chicken. Cook until the celery is just tender and the chicken is warmed through, 3 to 4 minutes. Season with fish sauce, if using, and lots of fresh lime juice. Stir in the celery leaves, cilantro, a generous spoonful of chili oil (or drizzle of hot sauce or chili flakes) before topping with toasted garlic and serving. 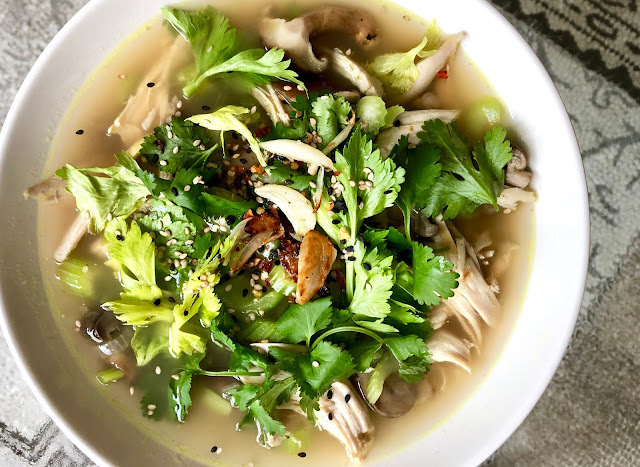 (The soup can be enjoyed on its own, or served over rice, rice noodles, or quinoa).